One of my favorite things to do is spend time with friends and family. Where I’m from, the best times of the year are summer and the holidays. I think the holiday season is a tad bit more intimate than the summer because we tend to gather around and snuggle up just a touch more. Something about cold weather and holiday cheer makes everything wonderful. Or, could that be the festive atmosphere and the holiday cheer in a bottle? You know…a little glass of grapes or two. Regardless, I love this time of the year because I enjoy making hearty recipes that stick to you. Granted, I might not have a ton of time to cook or bake, but I always manage to show up at a gathering with a dish. If I’m entertaining, my guests already know there is going to be a ton of food. Since there is a little old grandma in me, I make a FULL meal down to dessert. OK, let’s face it, dessert is my favorite part of the meal. Luckily for me and my friends, I had a neighbor many moons ago that moved from North Carolina and loved to cook. My grandmother tried to keep me out of the kitchen, because in my younger years, I managed to burn my hand and arm. So, she figured I was safer out of the kitchen. LOL! My neighbor was so kind to help me out because I didn’t want to be newly married and unable to cook. Y’all, my cooking was bad when I started out. 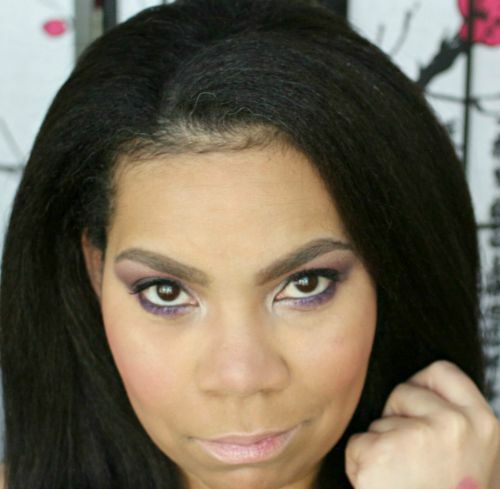 My poor ex-husband suffered through it and never once complained, to me. LOL! I’m happy to say that with time and Vicky’s patience, I learned a lot and I seriously enjoy cooking. BTW, I haven’t managed to burn or break anything since 2007ish. I’ll tell you the story another time how I broke my finger making cupcakes. The holidays are the perfect time of the year to spend enjoying time with friends and family and not in the kitchen. My first attempt at making a dump cake was super simple but now years later, I’ve spiced things up a bit. Don’t get me wrong, it’s still easy to make but I’ve created other recipes that have a bit more to them. 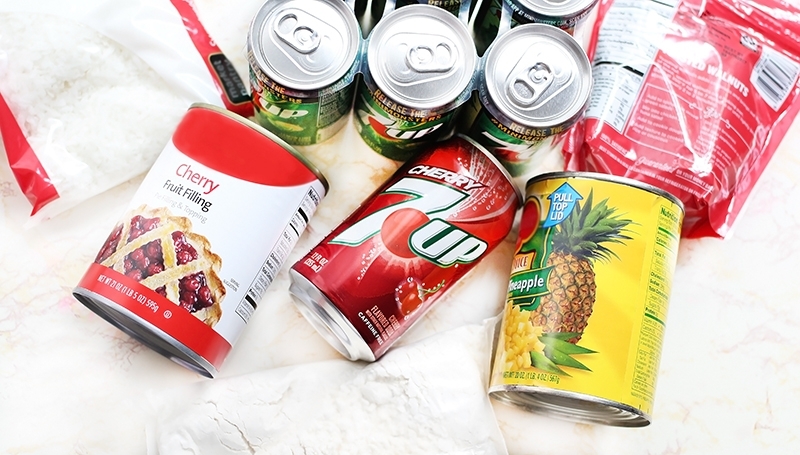 With this recipe, you can swap the cherry pie filling for a strawberry on and use regular 7UP® instead of cherry. The ingredients for this recipe are easy to find and you may have some items in your pantry already. Now, let’s get into this recipe! For this recipe, you don’t want to use a traditional cake pan. I would recommend a baking dish like the one that I’m using. Now don’t blink because this recipe is going to be over very quickly. 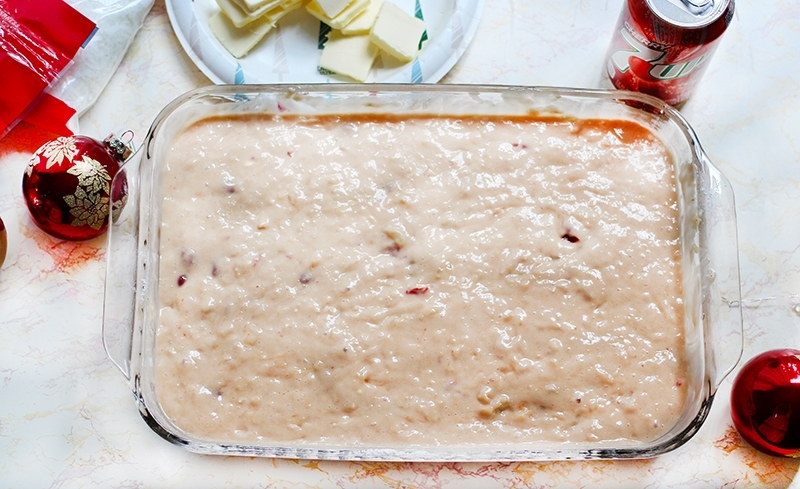 In your baking dish, DUMP the pie filling, your favorite yellow cake mix, pineapples, and 7UP. 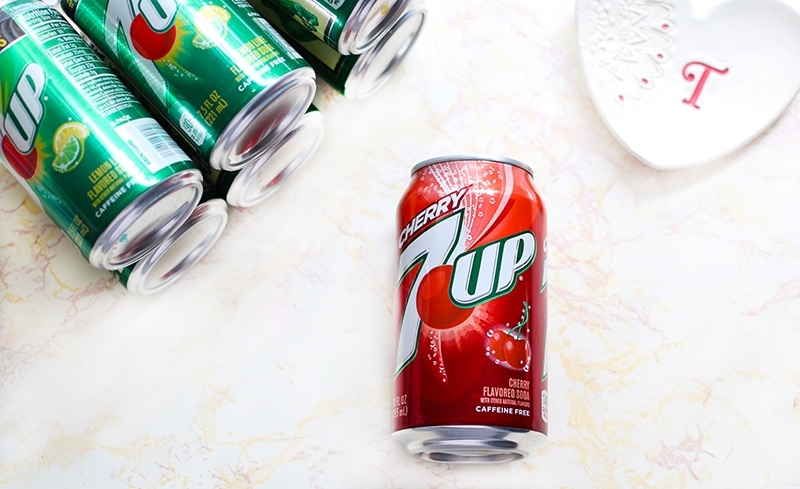 Since I’m using cherry pie filling, I decided to use Cherry 7UP®, but you can also use regular. Mix the ingredients together. 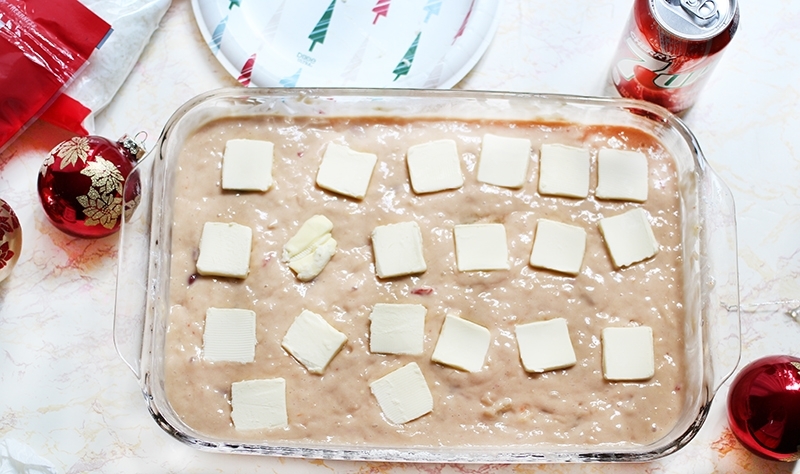 Next, slice one stick of butter and layer it over the mixture. 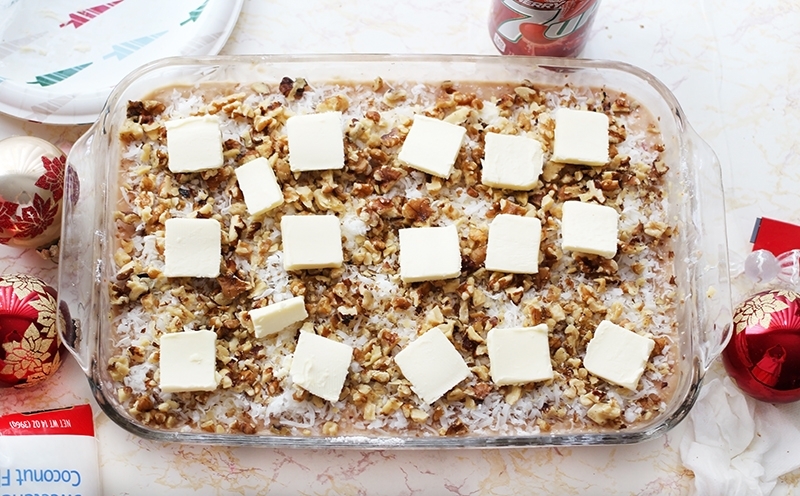 Top the butter with coconut flakes and nuts. 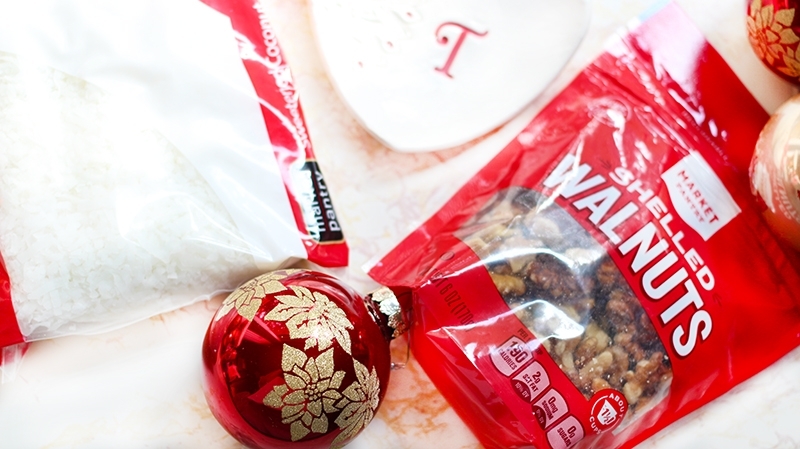 I prefer to use walnuts but you can use what you prefer. Lastly, slice the second stick of butter and layer over the coconut and nuts. 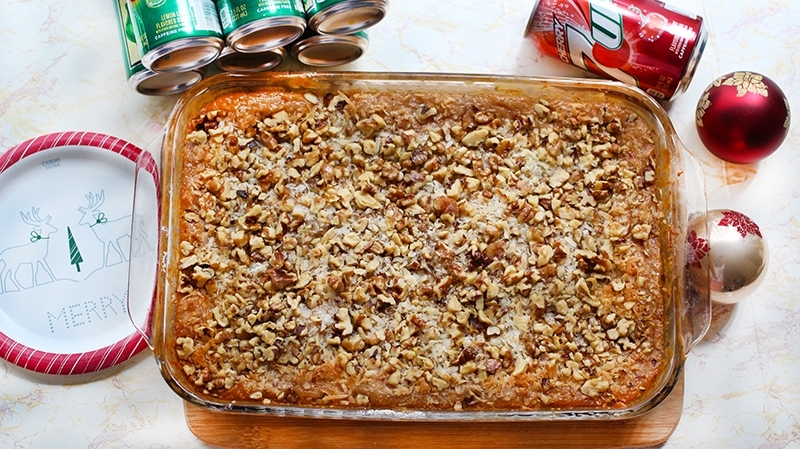 A quick and easy dump cake that is great for a family dinner or entertaining. 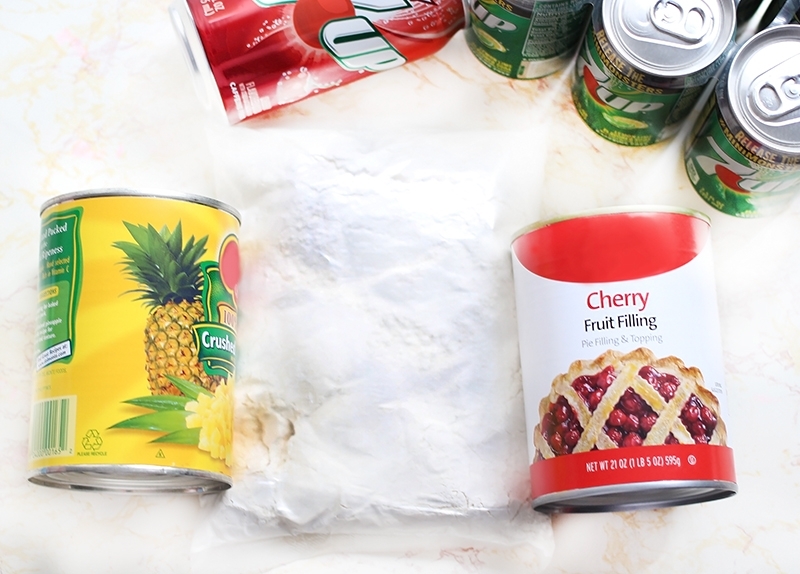 Add pie filling, cake mix, pineapples, and 7UP to baking dish. Mix the ingredients together. Slice one stick of butter and layer over cake mixture. 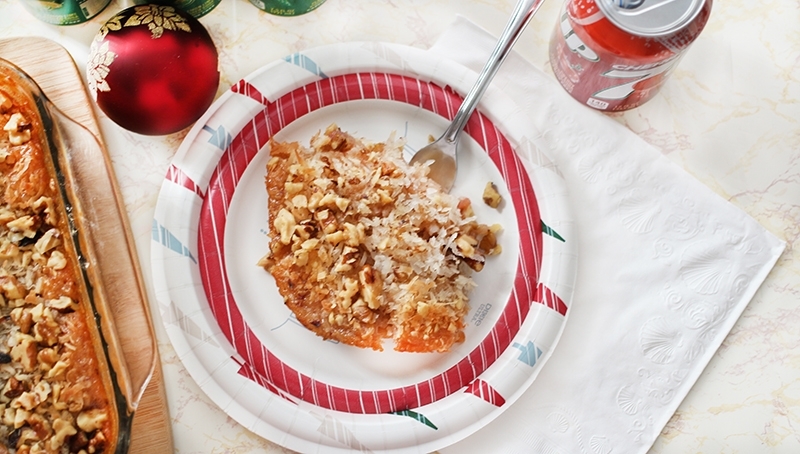 Next, layer coconut flakes. Add a layer of nuts. 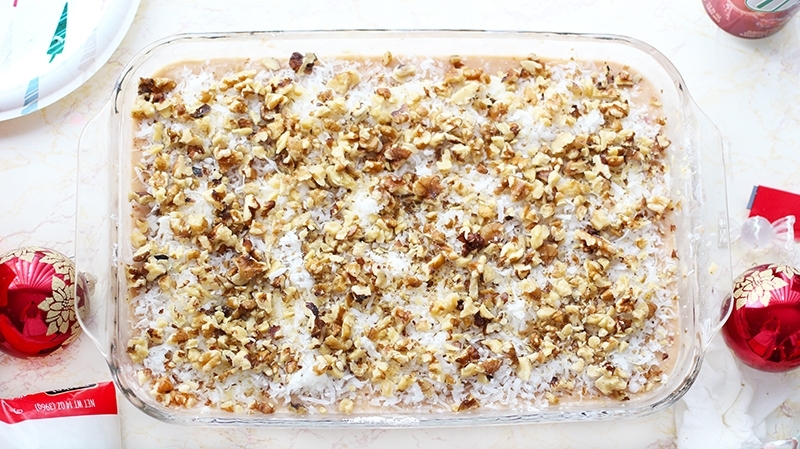 Slice second stick of butter and layer over coconut and nuts. Bake in preheated oven on 350 degrees for 45 mins or until the a toothpick comes out clean. After the cake is done, allow it to cool and serve. 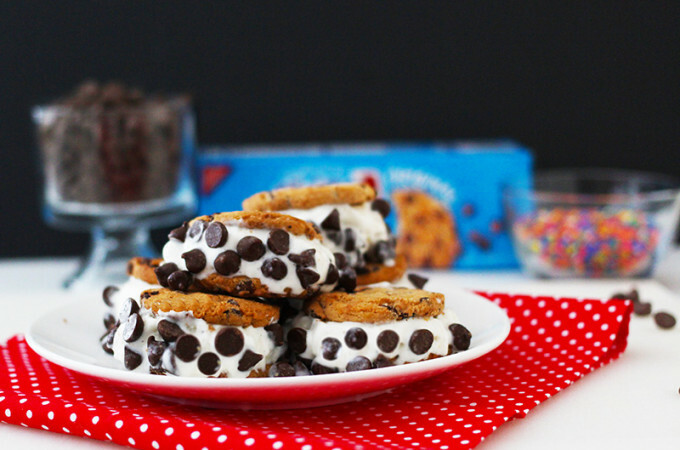 Or, you can always serve it warm with a scoop of ice cream. 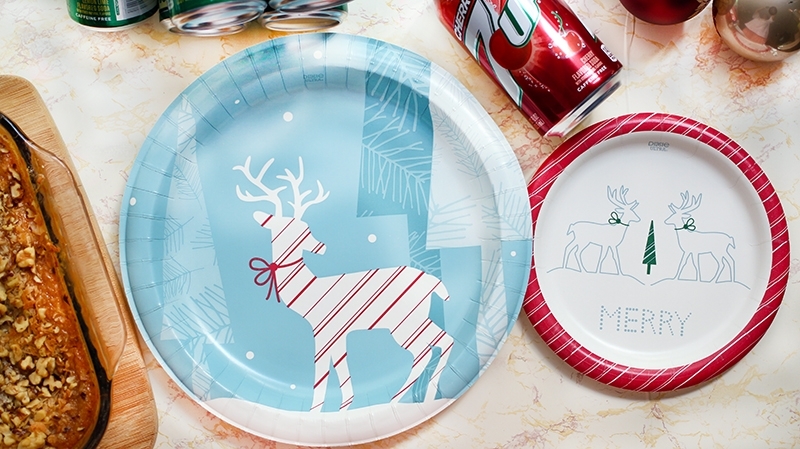 How adorable are the Dixie Ultra® Holiday Plates? 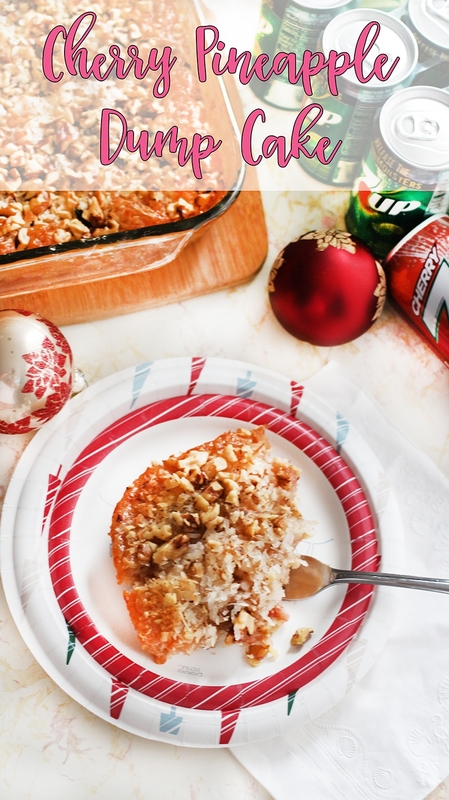 Aren’t they the cutest and just perfect for holiday entertaining? See! I told you the recipe was super simple. This is something you can put together while you are getting ready for your guests. The ingredients are easy to find. I grabbed everything from my local Target. 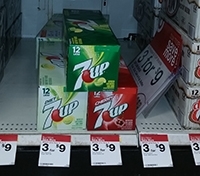 Right now, Target has a Cartwheel deal on the small 7UP cans. 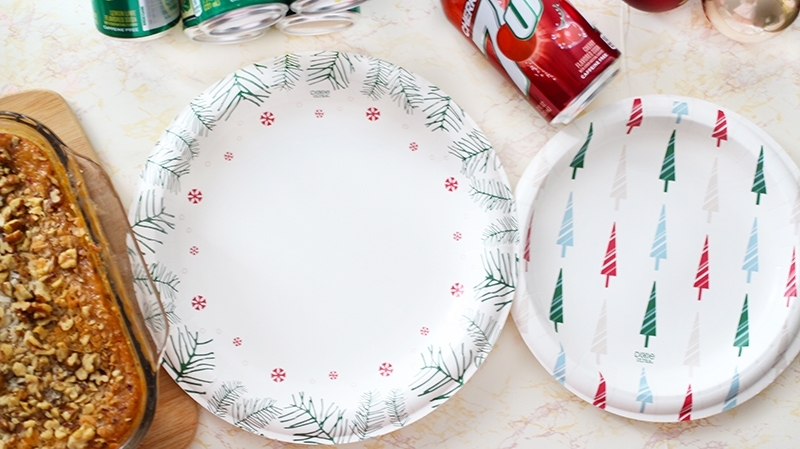 You can also pick up the Dixie Ultra® Holiday Plates and Vanity Fair® napkins from Target. Both make cleaning up after your company leaves a piece of cake! I hope you enjoy this recipe. I’m sure your friends and family will love it!